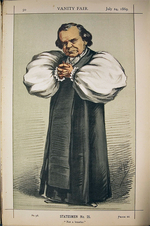 Caricature sketch of the English bishop Samuel Wilberforce (1805-1873) from the magazine Vanity Fair. Wilberforce became famous for his opposition to Darwin’s theory. We all know who Charles Darwin was. We know that he travelled the world on the HMS Beagle and wrote a series of books. We also know that he played a crucial role in the development of the theory of evolution with the release of The Origin of Species. It is also well known that not everyone cared for him and his ideas. Darwin and the theory of evolution caused a debate which began in the 1800’s, continued into the 1900’s and is still relevant in the 21st century. Part of the debate relates to science and religion while another part relates to purely scientific questions. In many other contexts, Darwin has always had a constant and important significance throughout the last 150 years i.e. education, society, culture, politics, philosophy and religion as well as on the fundamental self-awareness of mankind. On the following pages, you can read about how Darwin has been studied and how the theory of evolution has been researched historically. You can also read a series of articles about Darwin and evolution in various contexts. There is plenty of food for thought and discussion.